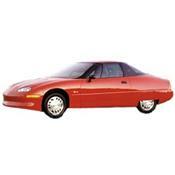 (1996 - 1999) The EV1 is offered as an electric powered 2 passenger, 2 door coupe. It's powered by a single speed electric 3-phase AC induction engine. ABS is standard. slow, boring, breaks down a lot. This car is the worstest car I have own. Can be limited, and can be quite pricey when leasing a new one. GREAT CAR!! If it seated four, it would be my primary car, but since it doesn''''t, i need to have my 99'''' Passport as a back up. The EV1 accelerates from 0-60 in only 7.4 seconds, and from 0-30 in 1.6 seconds. Its enough to throw your head back and in most situations, smoke the two front wheels. Its very smooth, for it doesnt have to switch gears. There is absoltely no maintaince needed, except for tire rotation. ENGINE...BRAKES....interior-sun visors don''t stay on. Lots of torque, Great handeling, cheaper than gas, around $1.50 per 70 miles. Console, AC, and Stereo/speakers. Large blind spot. Only 150 mile range per charge. Overall a great commute car.